HONESTY, OUTSTANDING CRAFTSMANSHIP & COMMITMENT TO QUALITY ARE OUR CORE VALUES. Jewel Tech initially started in 1984 under the name “S.P. Color Stones”. At that time, it mainly specialized in sourcing and selling of fine Burmese rubies, Ceylon sapphires and other precious color stones. 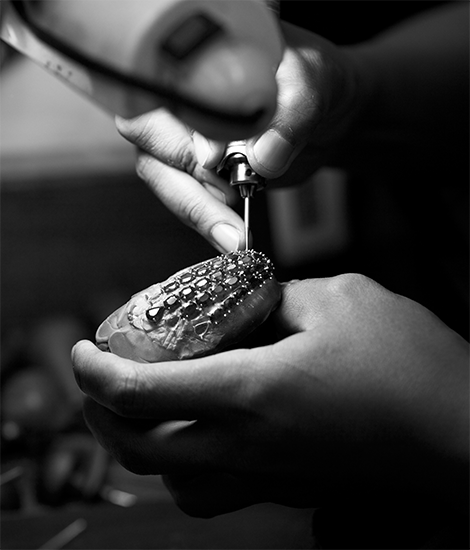 As the business grows, the company expanded by establishing a small in-house workshop to keep up with the demand at its own jewelry store in Bangkok. Driven by passion and dedication, “Jewel Tech International Manufacturing Co., Ltd.” was established in 1991 with a vision to create the finest jewelry collections at reasonable prices without sacrificing quality and style. Jewel Tech (Jewelry & Technology) was named to honor the huge success we received shortly after opening from our invisible setting collections which formerly ignited our brand awareness. With an impressive craftsmanship, Jewel Tech was able to enter the worldwide market, before earning its reputation as a leading manufacturer in the industry. Presently, Jewel Tech employs more than 200 skilled artisans in-house and continues to produce exclusive collections for well-known jewelry brands, and supplying its finest gold jewelries to stores globally. Jewel Tech exhibits in all of the biggest jewelry trade fairs, launching new collections every show, providing a support network for all of our clients worldwide.